The core thing is to select your Implementation method. This might requiretechnical specialist's advice, but this is not obligatory. Implementation method determines the way you will get notified about successfule payments and errors. Important. If your company is registered in Russia, fill out the settings under your Merchant Profile. If it is registered somewhere else, our manager will send you a technical questionnaire. Apart from that, technical integration does not depend on the country. Additional feature: we can help you integrate with an online sales register (to comply with Federal Law No. 54). In this case, you will transmit details required for creating a receipt to us. And we will transmit these details to your online sales register. Via email—we will send you an email after each successful payment to the address you specified under your Merchant Profile. In this case, you need to process each message manually. You will not get notifications about failed payments. Via HTTP—you send requests about payments' statuses or wait for notifications (we send them to a special URL on your site or service, which you specify in your Merchant Profile under the store's settings). You need this for automated order processing: for custom-made service or the CMS. It serves for uploading information about payments to your system. For instance, for changing the payment status in your online store to 'Paid'. Or for uploading information about payments to accounting systems as 1C. Imagine that Alice and Peter made a purchase at an online store. Alice paid for her order with a bank card right away, while Peter chose payment upon delivery. The store receives HTTP notifications and processes the payment information in a real-time mode. The manager will open the dashboard, view the order list, and see Alice's order is paid and Peter's order is not paid. Email protocol: we send notifications about successful payments at an email address. This method works fine if you do not process your orders automatically. It is easy to implement on any site. API: you request an order status from us or wait for our notification. This method allows for processing orders automatically. It requires additional development with an integration via the . We also have an implementation method called HTTP Protocol: it is used for work under the outdated . We support this protocol, but do not sign up new stores using it. You can change the method if you are yet to send us the questionnaire. You can save settings in progress and return to them later for filling in the things you need. When everything is filled, push Send—your settings will be transmitted to our technical specialist for check. If something goes wrong, we will get in touch with you. 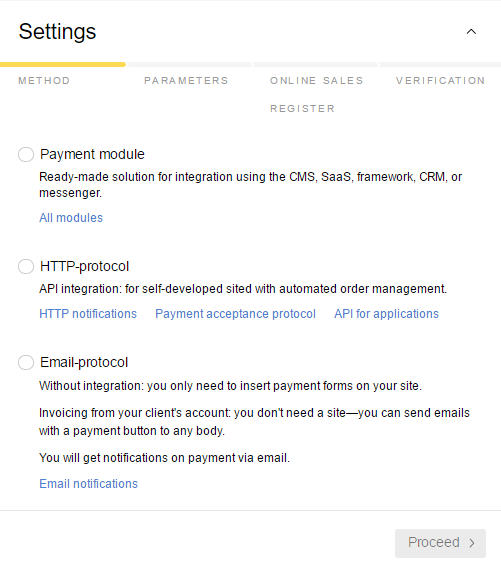 If everything is correct, we will send you implementing manual and add Settings section to your Merchant Profile. In this section, you can see parameters to set up on your side. Specify the address where you want to get notifications on payments to, and you are ready to send the settings to our manager right away. Specify the address in your system to which you want to receive out notifications about payments. Firstly, select the system your site or service operates under. If you did not find one, check with our manager to make sure whether we have a payment module for your system. 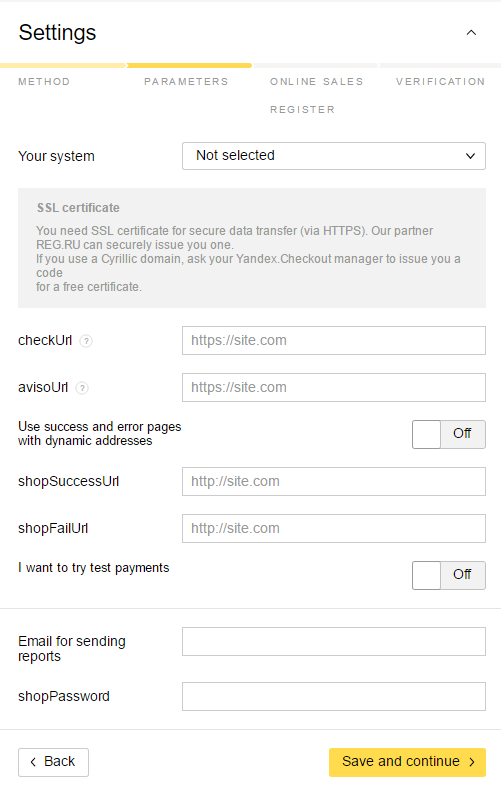 In this case, you nevertheless can sign up for Yandex.Checkout, but using another method. Without integration, with email notifications. Or with integration via our protocols—in this case, you will need to create a module for your system. All addresses are filled in automatically: you can adjust them, but only if you are sure it is necessary. checkUrl—to this address you will get requests for checking payment parameters before executing the payment. avisoUrl—to this address you will get notifications about successful payments. You can specify pages where your buyers, after paying on your site, will be redirected to either upon hitting a special button (set by default) or automatically (set by request). shopSuccessUrl—a page the buyer will see after successful payment. shopFailUrl—a page the buyer will see if the payment returns error. To get notifications to other addresses in the course of test payments, turn on I want to try test payments and specify the required addresses. Email address for registers—you will get your daily payment registers to this address. shopPassword—a secret word; you will need to enter it in the module settings on your side. Activating some modules require the SSL certificate. You can issue one for free from our partner REG.RU directly in your Merchant Profile under Settings (if you have already entered into contract with Yandex.Checkout). Fill out our questionnaire about your company, sign the contract and send it to us for check. Fill in the technical settings. Save them, but do not send them for review. As soon as the contract is checked, a button Get certificate will appear under your Settings. 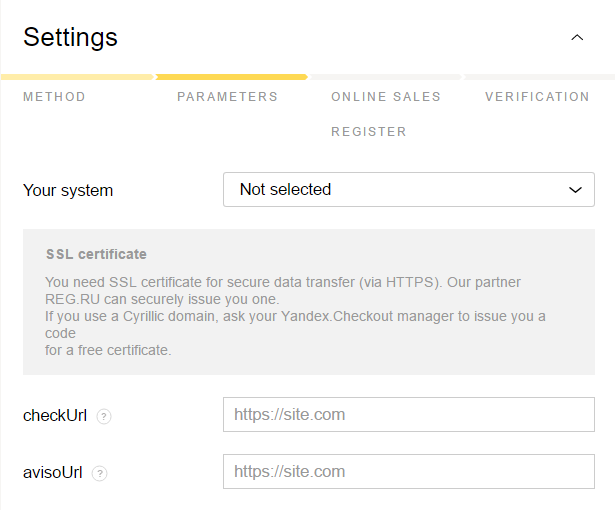 You can only get the certificate for one site signed up for Yandex.Checkout. If you cannot collect the certificate in your Merchant Profile, request it from our manager. In certain cases, you can get an additional certificate for the second site. It depends on the selected implementation method, on the method you are going to process our notifications. You only need to embed our payment form in your site. 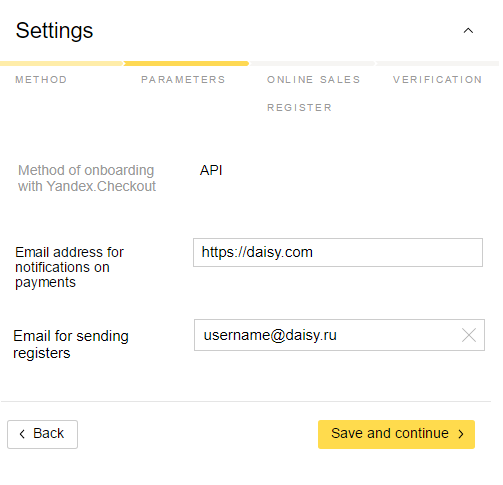 Your buyers will see a button Pay with Yandex (or any other you choose). 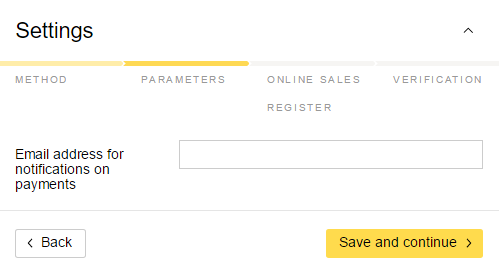 You can ask our manager for the form or build one of your own (view parameters and sample). scid—identifier of the payment form. You can edit the form using any text editing program. You need to enter the parameters exactly as shown in the documentation, case-sensitive. Signing up a store requires a development via the . Depends on your system and the version of the module you use. You can check with instructions to know for sure, the instruction is usually built in the module. If it is not, check it with the module or CMS developers.